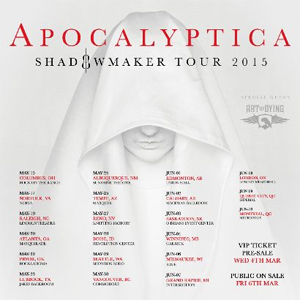 Finnish metallers APOCALYPTICA, have announced dates for a North American headline run in May/June, with art of dying providing support. VIP tickets will go on sale on Wednesday, March 4th, with public on-sale scheduled for Friday, March 6th. On September 18th, APOCALYPTICA will be performing at an exclusive show in the magnificent Roman Theatre in Plovdiv, Bulgaria. The event will be promoted by the Bulgarian independent radio station, Radio Tangra Mega Rock. Tickets are now on sale HERE. This will be the fifth edition of the annual Sounds Of The Ages event headlined in the previous years by PARADISE LOST, ANATHEMA, ASIA, FISH and TARJA TURUNEN. Watch the official Radio Tangra Mega Rock website for updates.